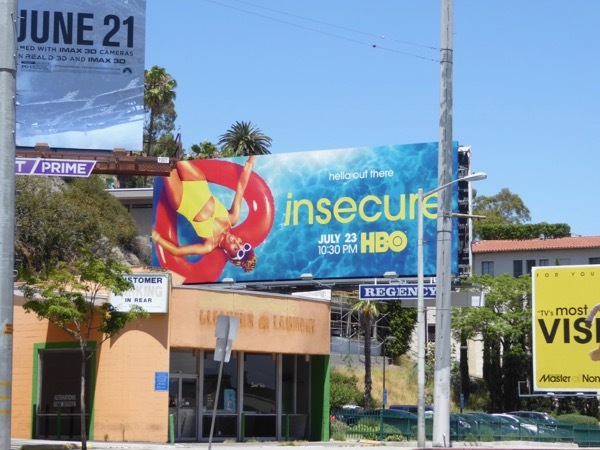 If these sophomore season billboards for HBO's comedy Insecure don't get you in the summertime mood, then we're not sure what will. 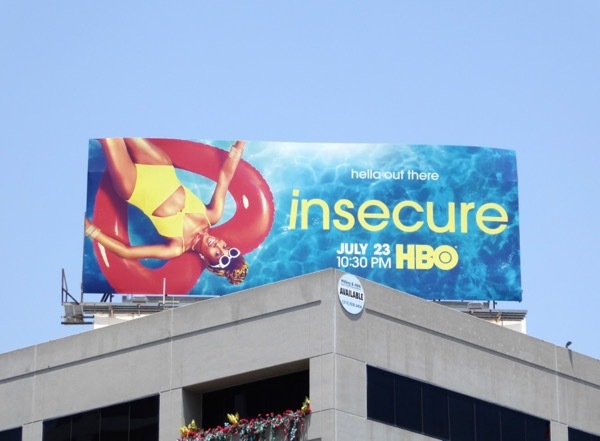 Issa Rae looks like she's loving the fact she's back for a second season as she chills in a swimming pool in her heart-shaped inflatable float. 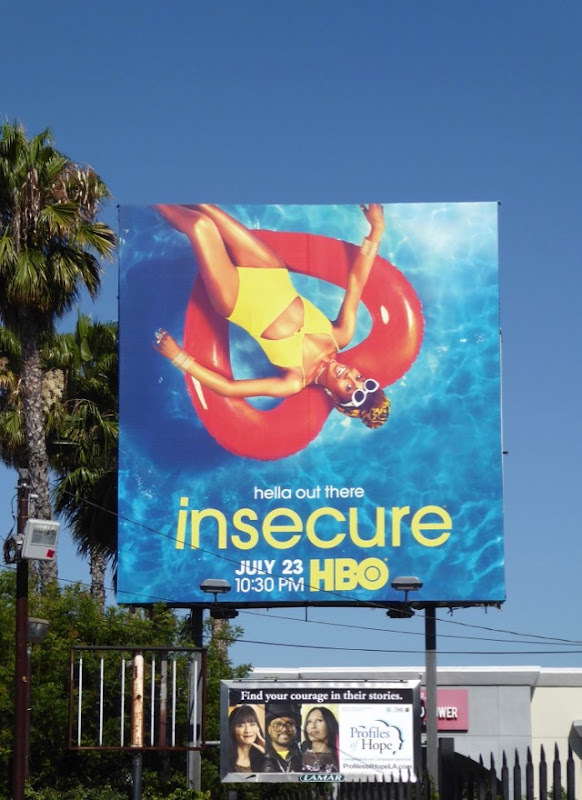 Insecure was one the standout smashes of 2016's TV offerings, but received one of the harshest snubs with no Emmy nominations this year. 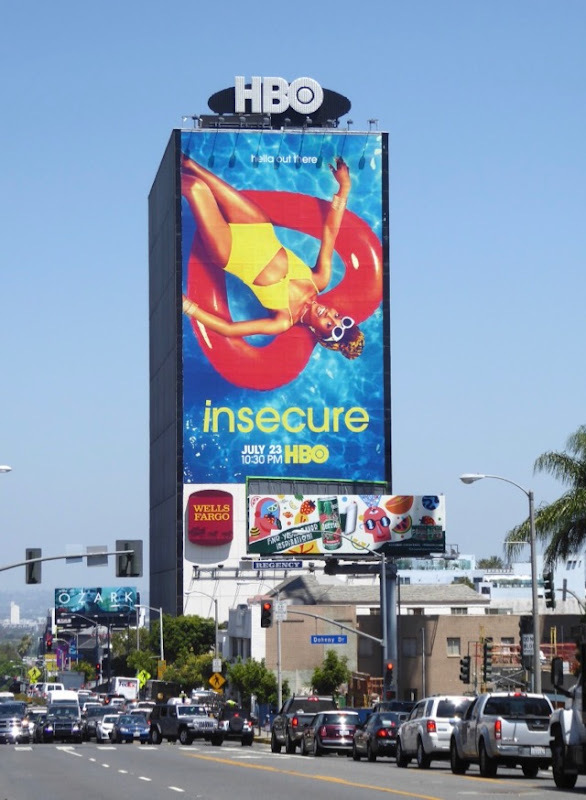 But undeterred, Issa Rae is back as young black woman 'Issa Dee', dealing with messy relationships and breakups, candid sexual situations and satirical workplace interactions living in L.A. 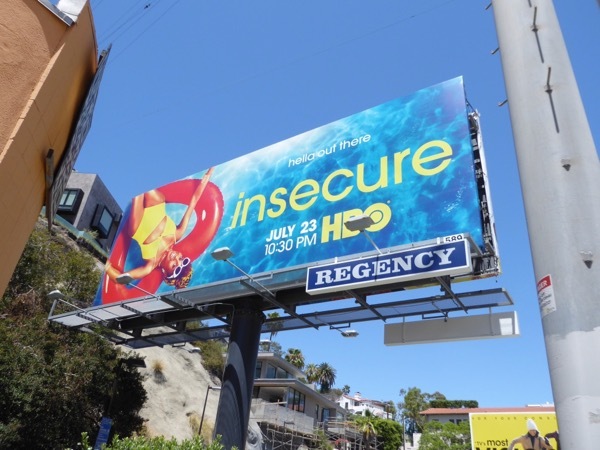 These vibrant season two billboards were first spied along West Hollywood's Sunset Strip on June 27, then later along San Vicente Boulevard, Pico Boulevard, Westwood Boulevard and Ventura Boulevard through July 4, 2017. 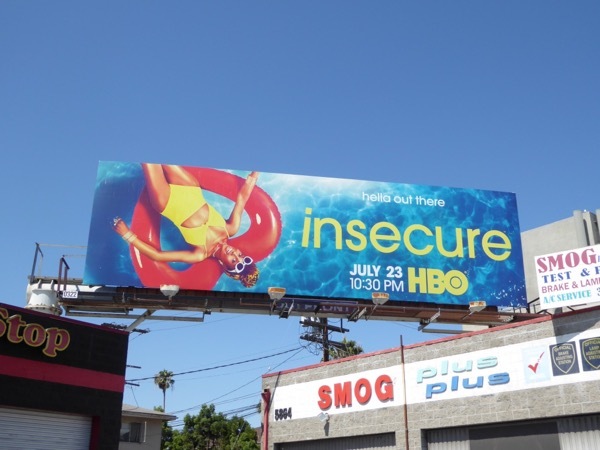 Fans of the hit HBO comedy, by the star of the web series Mis-Adventures of Awkward Black Girl, can also check out these Insecure season one billboards from last fall. 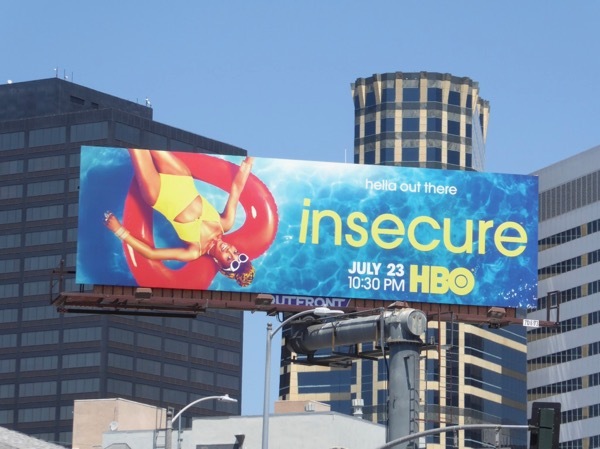 Are you ready to dive in and enjoy the second season of this far from insecure comedy? 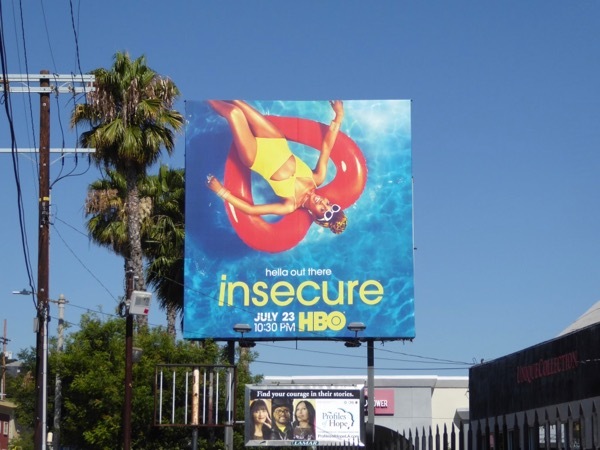 UPDATED: Issa Rae was also getting super-sized for Insecure's second season. 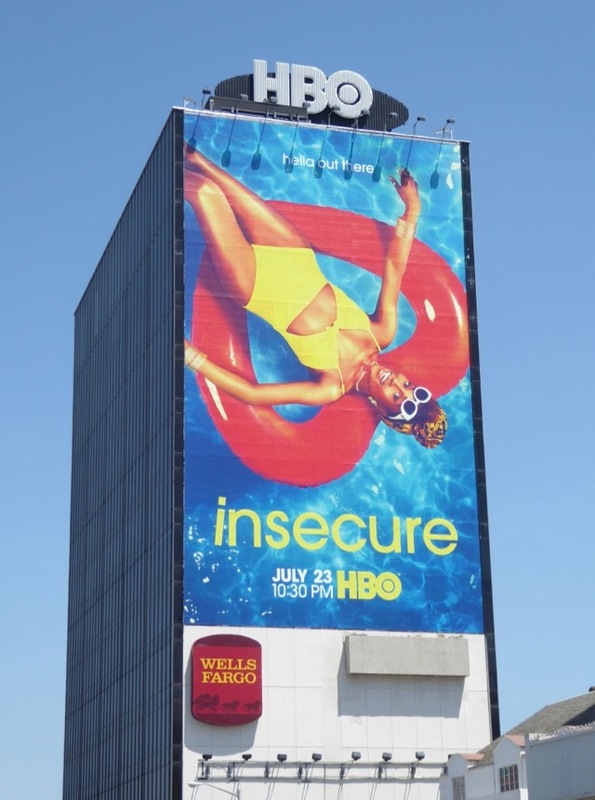 This giant billboard was snapped radiating summertime vibes above West Hollywood's eastbound Sunset Strip on July 22, 2017. UPDATED: Can Issa garner another Golden Globe nomination this awards season for the sophomore year of her HBO comedy? Maybe this fresh 'For your consideration' billboard snapped along Highland Avenue on December 5, 2017, will help. 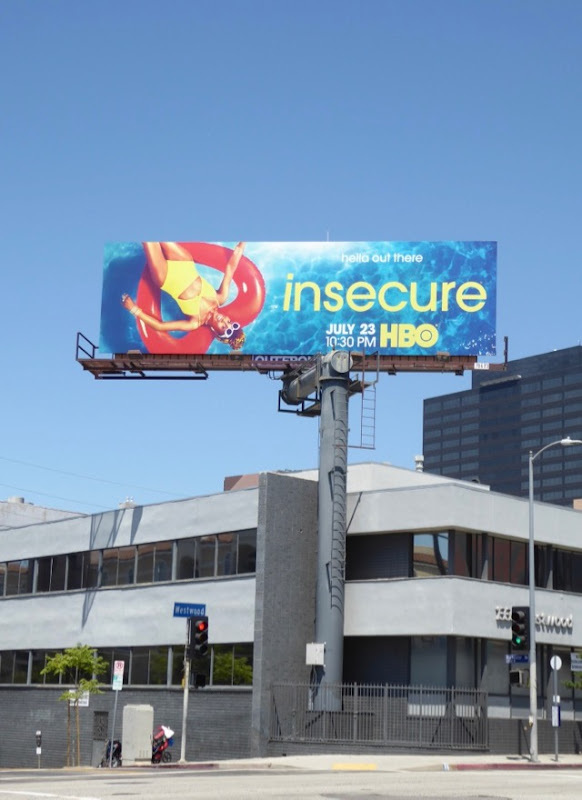 UPDATED: Here's also an Emmy consideration billboard for Insecure's second season spotted along Sunset Boulevard on May 10, 2018.